Not to be confused with World 3-4. Area 3-4 is the fourth course of Teatime Twirl and the twenty-second course overall in Mario vs. Donkey Kong: Mini-Land Mayhem!. The level features a Mini Mario, a Mini Toad, and a Mini Peach, though not necessarily in the same starting positions. 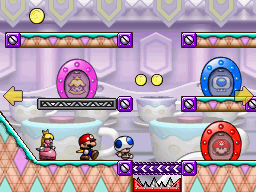 The Mini Mario begins on a platform on the upper level near the center while the Mini Toad begins on a platform on the top right and the Mini Peach begins on a platform on the lower level near the center, with the Mini Mario door on the bottom right, the Mini Toad door on the middle right, and the Mini Peach door in the very center. In order to reach them, the Minis must simply use the Purple Conveyors to reach their respective doors. The M-Token is located on the bottom left, just below the Mini Mario door. To collect it, a Mini must simply use the Purple Conveyor to the right of the Mini Toad door. The Mini Mario Card is located on the middle level, atop a platform on the left. The Mini Mario must be led to it via using the Purple Conveyor on the left along the upper level. In Plus Mode, the Mini Mario must be guided to the exit door first, followed by the Mini Peach and then the Mini Donkey Kong. In order to earn a trophy, the player must score 14300 points. This page was last edited on September 18, 2018, at 04:02.